Knorr-Bremse, a leading systems supplier for the commercial vehicles industry, has signed a strategic cooperation framework agreement with FAW Jiefang Automotive Company, a leading manufacturer of commercial vehicles in China. This marks the beginning of a new stage of closer cooperation in multiple areas. In recent years, the rapid development and upgrading of China’s logistics and transportation sector has called for equally rapid upgrading of systems and equipment. New trends, new challenges and new opportunities have emerged in the Chinese commercial vehicle market. 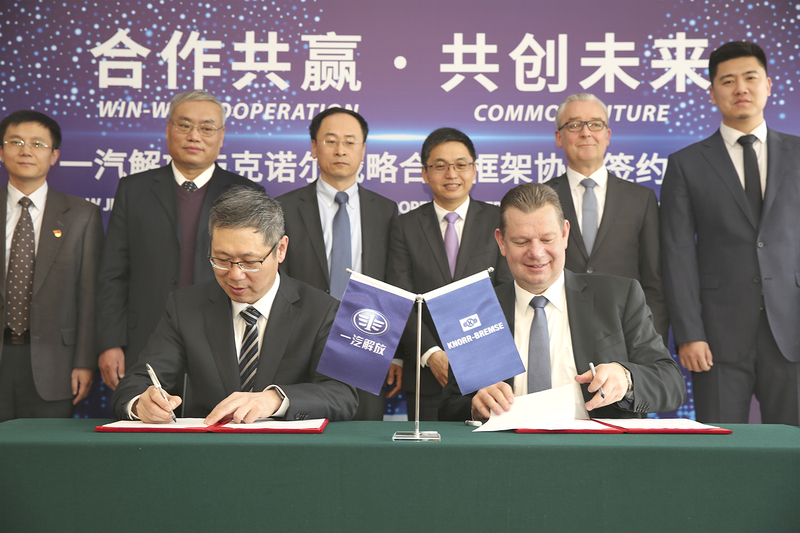 Knorr-Bremse and FAW Jiefang are planning a close and comprehensive strategic cooperation in commercial vehicle braking systems, AMT products, and AMT calibration, as well as in chassis components, steering systems, smart driving, and other areas. Founded in 1953 in Changchun, China, FAW Jiefang Automotive Co., Ltd. has 21,000 employees and posted HDT and MDT sales volume of 265,000 and a market share of 19.7% in 2017. The company is a subsidiary of China FAW Group Corporation. “Knorr-Bremse focuses on the overall control of braking and steering and is a world leader in the technology that makes autonomous vehicles safer,” said Mr. Hu Hanjie. “Our cooperation with Knorr-Bremse will actively promote the development of a smart driving technology sector and enable Chinese commercial vehicle and related industries to reach the global technological forefront.” The signing of this strategic agreement is not only a tribute to the positive results achieved in the past. Both parties also expect this wide-reaching strategic cooperation to take their technical partnership to a new level, with the prospect of more broadly based collaboration in the future. Mr. Xu Baoping, President of Knorr-Bremse Commercial Vehicle Systems Asia Pacific, added, “As a supplier of braking systems, Knorr-Bremse has its USP in innovation, energy conservation, environmental protection, and safety. In addition to ADAS, the world-leading technology, and the lightweight disc brake specially designed for the Chinese market, Knorr-Bremse offers mature AMT products and steering systems with flexible and highly-reliable components for chassis systems. We can therefore provide better support to FAW Jiefang in technology application and upgrading. This will also help China’s leading manufacturer to be more competitive in the world market in spite of the increasingly competitive environment.” Both parties also pledged to strengthen their cooperation in the fields of brand cooperation, research and development and marketing as well as information exchange.